Proudly serving Danbury, Bethel, Brookfield, and western CT for 17 years! With over 17 years of experience in landscapings, Roots Landscaping is just the company that you need for your pool fence installation or repair. Roots was founded with a vow to provide the best landscaping service in the Brookfield, Danbury CT area and has dedicated itself to this goal ever since. Roots takes great pride in our fencing work and has grown and evolved with the industry’s shifts. If you’re looking for a pool fencing company why not go with the best in the area? The short answer is that CT state law requires that your pool have a fence or barrier. The main reason for this law is safety. Without pool fencing it is very easy for injuries to occur. Children might get into the pool at times they are not supposed to or allowed to go. While at other times the danger might be individuals tripping and falling, potentially breaking bones or worse. If you have guests or young children it is especially important to have a pool fence to keep them safe. There are some other benefits as well. Pool fencing can add some measure of security to your pool and the surrounding areas by keeping intruders and roaming animals out of your pool area. 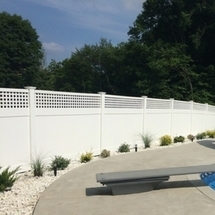 Finally, a pool fence around your Danbury home does not need to look unappealing. A well made/installed pool fence, like the ones you could expect from Roots Landscaping, can make your pool look good, in addition to providing great protection. If you’re not sure what material to use give us a call and we can help. No matter your choice, Roots Landscaping will make sure your fence looks fantastic and fits perfectly with your home. We make sure to thoroughly review the relevant pool and fence regulations before every job. Many cities and towns have their own pool regulations so we ensure that we are on top of them so you won’t run into any problems. 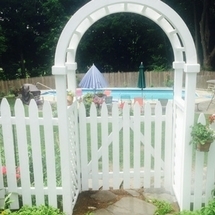 Here are a few of Connecticut’s most important general pool fence regulations that apply to Danbury CT.
You can learn a bit more about CT pool regulations on the CT government website. Keep in mind, as mentioned before, that many areas have their own pool codes. See Greenwich for an example. Do you already have a pool fence at your Danbury home but parts are damaged, bent, or otherwise in disrepair? No need to panic. Roots Landscaping can repair your pool fence and make it look as good as new. We are expert at working with aluminum, chain link, vinyl wire, and wood fences. Be careful not to let your pool fence stay in bad shape long. A busted pool fence is considered a safety hazard and potentially leaves you open to serious lawsuits! Roots Landscaping is a BBB accredited company and Danbury’s top rated fencing contractor with expertise in installing and replacing wood, vinyl, chain link, and aluminum pool fences. 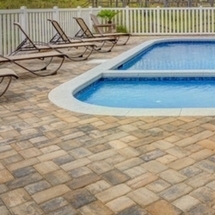 If you have a pool and no fence, are planning to build a pool, or have a pool fence in need or repair Roots Landscaping is the solution to your problem. . Contact us or call today at 203-304-7326.